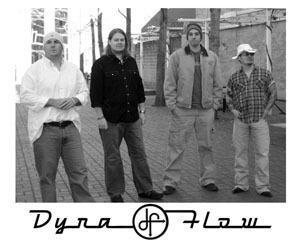 Dyna Flow is a four piece rock band that transforms parts of each member’s personal influences into a unified device. The band was designed to relieve the audio strain caused by overly frequent airplay of the latest fad and the worry of seeing your average bar band. Their influences are very different but they are all bound together by being pioneers in their respective genres. The greats of the past have shaped Dyna Flow's original writing style as well as future efforts from these four guys from the Blue Ridge. Their songs have been described as edgy, energetic, sarcastic, and even mean. But they always tell their story with the emphasis being on the music. The sound itself stays true to the dirty rock stylings that have provoked generations to get off their asses and have some good "clean" fun. The project started as the vision of two longtime friends and former band mates, Shane Allen and Daryl Clemons. The two reunited in the winter of 2006 and picked back up by doing what they had always done…jamming and sharing multiple instrument duties. Yet before the winter was over they had recorded several originals in Shane’s studio and needed to share the music with a wider audience. After spending time writing and recording, the two focused on searching for the right members to complete the lineup. They first contacted bass player Rusty Rupert, who they’d met in two other bands in the mid-Atlantic music scene. That winter Rusty happened to have been jamming with a neighbor, drummer Mike Kolnok. Rusty and Mike took the original Dyna Flow demo home and, a few weeks later, the band was complete. Their combined live and studio experience made for immediate productivity. The chemistry within this new, Roanoke based group is as smooth as it's namesake -- the gears on a ’53 Buick. The debut CD from Dyna Flow "Gears" is completed and showcases their unique sound and songwriting abilities. Watch for them soon to appear in a club near you!